Condé Nast Johansens recently announced the winners of their 2018 Awards for Excellence, created to acknowledge, reward and celebrate excellence across the hotels and resorts in their collection. Located at Hyatt Regency, THE BARAI Spa and Residential Suites has added another ‘feather to it’s cap’ by winning in the category awards, for ‘Best for Luxury Value’ as one of the top luxury properties in Asia. “I speak for myself and all of THE BARAI team when saying that we are delighted by the news that we have recently won the ‘Best for Luxury Value’ award in The Condé Nast Awards for Excellence. Wellness and exclusive spa treatments can be priced fairly and it brings us joy to be able to offer these services to our guests. 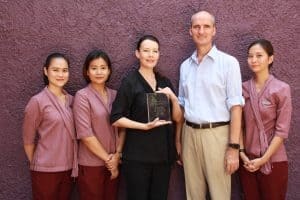 As a team we are very proud to have won this award and look forward to continue hosting and welcoming guests from all over the world to relax, rejuvenate and get a taste of true Thai hospitality.” Sylvia Marsden- Director of Spa at THE BARAI Spa and Residential Suites. Not only has THE BARAI won at the annual Condé Nast Johansens Awards, but also received ‘Luxury Hotel & Spa of the Year’ by The Luxury Travel Guide Awards 2017, and ‘Best For Wow Factor’ by Spafinder Wellness Travel Awards in 2016. These awards are a trusted mark of quality, recognised by luxury consumers and travel professionals alike.